Gisborne is a rural township on the Calder Highway, 50 km north-west of Melbourne. It was named after Henry Fyshe Gisborne, Commissioner of Crown Lands in the Port Phillip District, 1839-40. The Gisborne district was settled soon after Batman's and Fawkner's parties arrived at Port Phillip. In mid-1836 John Aitken brought sheep from Tasmania and grazed them on a pastoral lease at Mt Aitken, about 8 km south of Gisborne. In 1837 Henry Howey took up a pastoral station on the future site of Gisborne, on Jacksons Creek. (The same Howey also invested in land in Collins Street, Melbourne, where Howey Court was later built.) Shortly afterwards most of the land was occupied for grazing. In 1851 the government surveyor, Robert Hoddle, prepared a map of the Gisborne township, positioned near The Bush Inn (1840) and Jacksons Creek, on the road to Mount Macedon. It was also on the road to the Bendigo gold diggings, and passing traffic caused the town to quickly grow. A school was opened in 1853, a court house in 1858 and a mechanics' institute in 1860. Anglican and Presbyterian churches were opened in 1855 and 1858. Catholic services were held in the mid-1850s and a substantial church building was constructed in 1875. 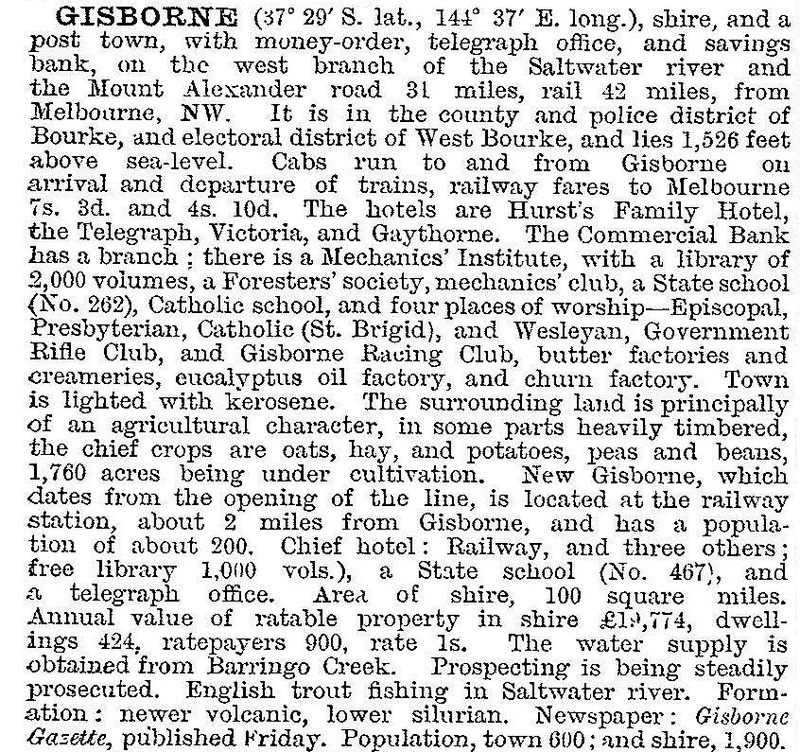 A railway line was built through the district in 1861, but passed about 3 km north of Gisborne via Clarkefield and New Gisborne. It was thought that the chosen route was influenced by the pastoralist William 'Big' Clarke, and he benefited from the sale of his land for the railway line. However, bridging the deep creek at Gisborne would have cost more than the purchase of Clarke's land for the line. Gisborne's minor growth changed to minor contraction until the years after World War II, although there were Cherry and Sons' farm equipment factory and (postwar) Flexdrive Industries. In 1970 the Tullamarine Freeway was opened, putting Gisborne within commuting distance of outer metropolitan Melbourne. During the next 25 years the town's population tripled and town water was boosted by the Rosslynne Reservoir (1974). The Calder Highway was duplicated c1986 by the Calder Freeway which bypasses Gisborne to the north-east. Despite the barrier caused by the freeway, population growth has virtually joined Gisborne and New Gisborne to its north. Gisborne has a hospital, a State secondary college, State and Catholic primary schools, four churches, a golf course, two ovals, a range of sporting facilities and a civic centre. It has a substantial shopping centre, including an enclosed mall with 26 shops (1989). Gisborne has a botanic garden next to Jacksons Creek and several buildings on the Register of the National Estate: the court house and police station (1858), a corner store and two houses. Hamilton Street, east of Aitken Street, is the main heritage precinct. There is also the pre-gold rush Macedon House, originally a hotel in 1846, at the eastern end of Hamilton Street. Sixteen percent of the shire was farmland in 1994, carrying 2450 meat cattle and 6000 sheep and lambs. On 19 June 1995, Gisborne Shire was united with Romsey, Newham and Woodend and most of Kyneton Shires to form Macedon Ranges Shire. In 2014 Gisborne secondary college had an enrolment of 1009 and the State primary school's enrolment was 405. (New Gisborne's primary school enrolment was 506, in 2014). A bushfire in the Macedon Ranges in 2014 damaged a number of properties in Gisborne South.